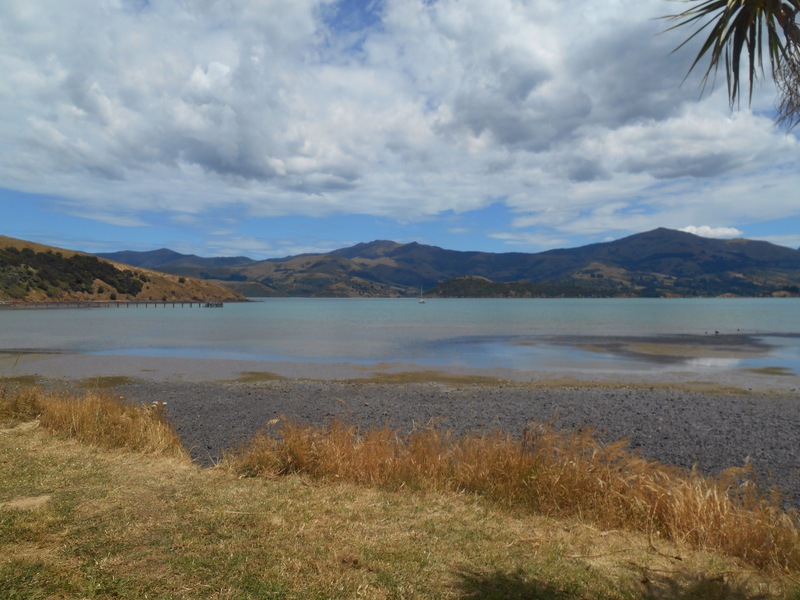 The day was warm and full of promise as I headed out map in hand to start the Little River trail into the Banks Peninsula. The trail started in the suburb of Hornby which was straightforward to find. From the start I headed off full of confidence, however when one hour later I was in an industrial estate, befuddled by my overly simple map, I was ready to quit, I just didn’t know how. Realising that with a week to my ferry back to Auckland and little other option, I pulled myself together and found the trails start, with the help of a tourist with about as much clue as me. It’s things like this that make such a difference being one, not two. When Alice left I naively thought, well I can take the tent down on my own, how hard can this be? However when we got lost together it was never such a big deal. When my lack of sense of direction becomes apparent I quickly convince myself that I’ll never see another human again. The trail led me through Prebbleton to Lincoln where I stopped for a coffee break. Even from this point with signs to follow, I couldn’t orientate myself whether I was heading on or back to the city. My inbuilt compass is seriously skewed. 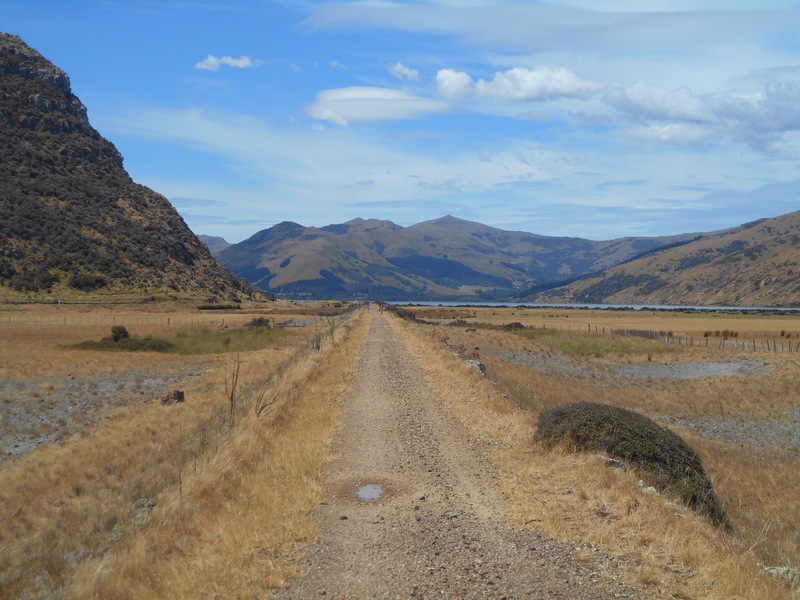 Back on track, the trail followed the old railway route into Banks Peninsula. With swamp like plains to one side and angular mountains to the other, I peddled in the hot midday, breaking into occasional verses of song as the time passed. The town of Little River was a quaint stop on the once railway line. I camped a little way off the road at a beautiful camp ground with a stream running through and a network of board walks to explore the nature reserve. The picnic benches looked like they could have hosted Alice in Wonderland and there was a ‘seriously scary water slide.’ At the top of the grounds was a great view and a garden swing to enjoy the late afternoon heat. Next on the agenda, make some friends. I befriended two German students, talking to each other in English so to be less conspicuous. I spent the evening with them watching a movie and they were really nice company. The warm morning, the coffee shop and the threat of a hilly days ride all made for a slow morning, but once I got going, it was a long and slow climb winding up the road until hilltop, then diving down again. As always, the encouragement from passers by made the journey enjoyable and the thrill of the hard earned downhill making for an amazing descent. 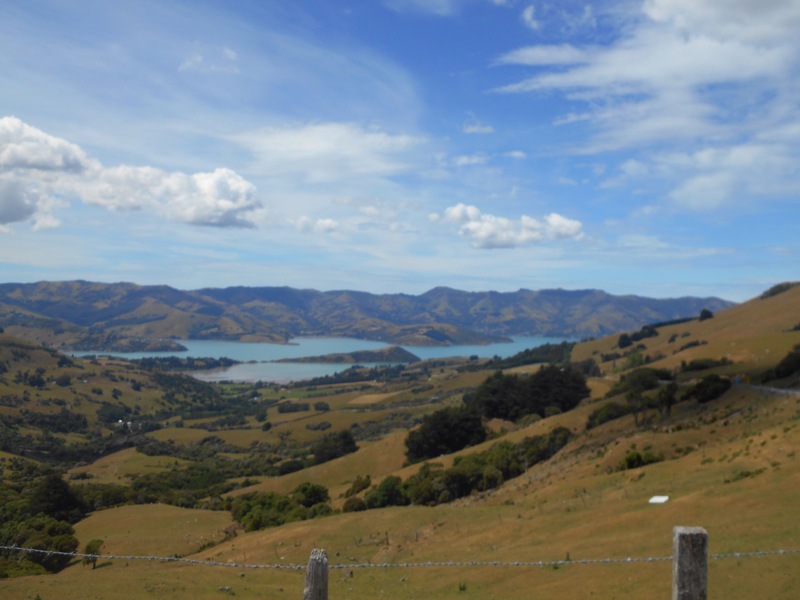 Banks Peninsula is like a bike wheel, or a PAC man. Once in the middle, the towns lie along the waters edge around the centre. I passed the small shore towns of Dauchavelle and little bays, each one separated by an upwards hike and a quick intake of electrolytes. 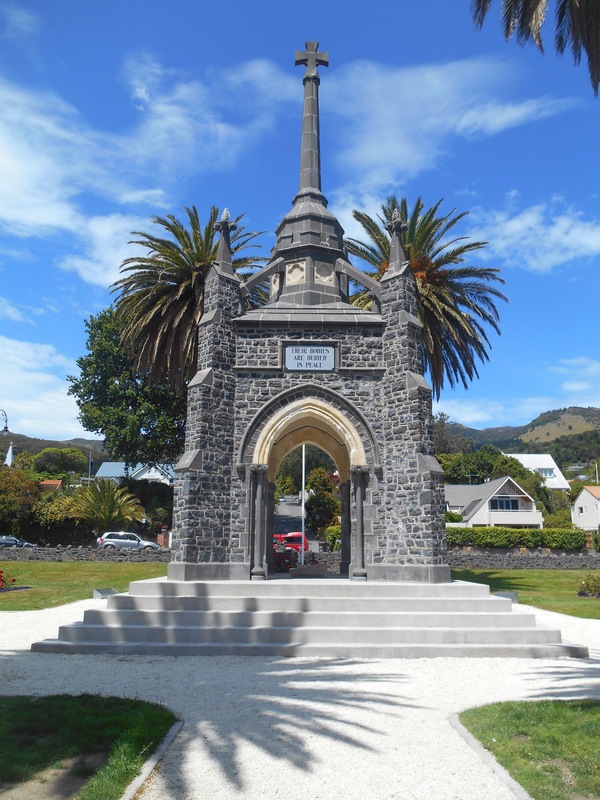 By early afternoon I was in the French town of Akaroa. The cafés were all inventively named, L’escargots rouge and Le mini golf being particularly memorable. Boats bobbed effortlessly on the clear water in the warmth of the summer sun. I had been reccomended to stay a little further from the town at Okunu Farm camp, ‘a bit of a hike’ he said. I should have heeded google maps warning of 6kms in 51 mins by bike. The road was gorgeous but the last 2km were almost vertical, and just went on. Then I got to the top, I decided that staying two nights here would mean I wouldn’t dare to leave, to afraid to climb the hill again, so I filled up my water bottle, put back on my dripping helmet, wiped the salt from my eyes and returned to town. It was certainly a picturesque ride, past the lighthouse. I took lots of photos hoping that with hindsight, they would make up for my tortuous journey. In the morning, amid the drizzle, I explored the small town with its interesting tourist shops and French flavour. Come the afternoon I had planned in which direction I would take the hills and head off toward the Hinewai reserve, a large area of forest spreading from summit to sea with a network of walks. It was only 9km but just in varying degrees of up. After 5 or so I was walking the bike in an upwards trajectory. A campervan passed me smiling friendlily, then back in the other direction. Then they returned back passed me and pulled over to offer me a lift. They were French and spoke very little English but helpfully manouvered my bike into the back of their vehicle and offered me to sit on their bed as we climbed upwards. For the one km I hitchhiked with them to the summit, I was anxious to avoid getting salty drips on their bedding, very grateful at their kindness. From the top it was a short, sweet decline to the park. The walks weaving through leafy undergrowth, then opening out to reveal the coastline. Every direction was either a steed ascent or descent, no such thing as a plateau on the peninsula. There was hidden waterfalls and grassy areas, and I managed not to get lost. The journey back to camp was a speedy downhill, quickly loosing the height I had so painstakingly gained. This is the day I had been so looking forward to, cruising the peninsula from the water. The mornings weather was grey and damp and I packed the tent away during the short dry pockets of the morning, then headed for the town. My cruise left from the harbour and despite the greyish start, the water sparkled and promised us a good trip. From the warmth of the boat with a coffee in hand, we meandered through the coves which make up the waterway entrance. It wasn’t long before we had some playmates. 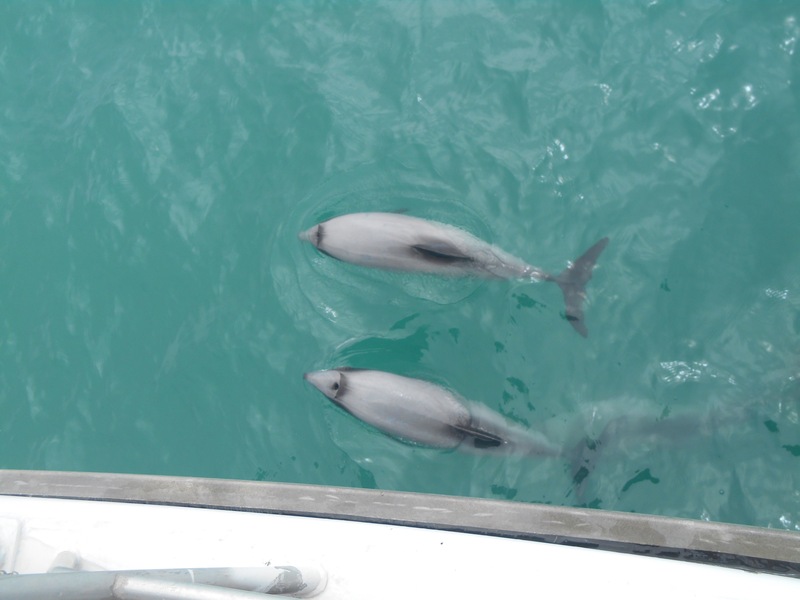 Some Hectors Dolphins were spotted beside the boat, then more followed dancing and jumping next to the catamaran, enjoying the boats ripples in the water. 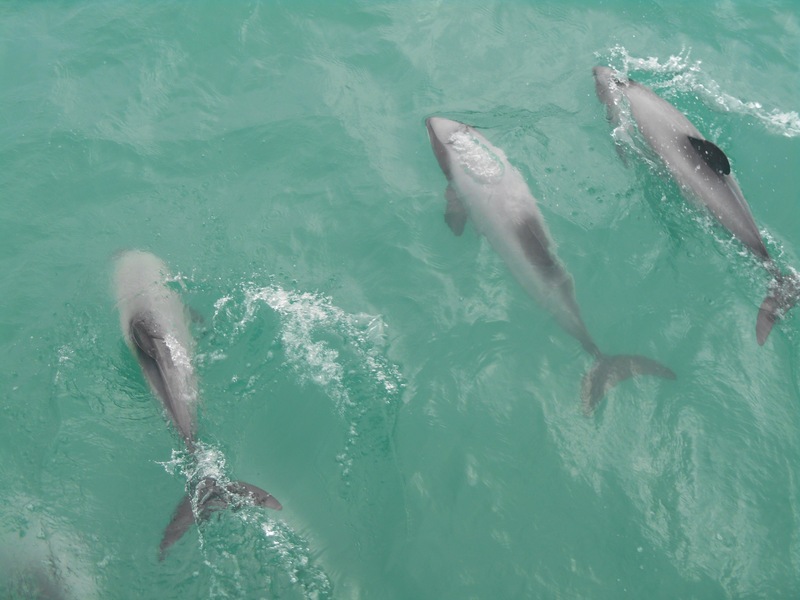 There was around 12, dolphins, congregating boat side and coming up to the surface to breathe noisily. At around a metre long, these beautiful but endangered creatures are only found on New Zealand’s east coast, marked with grey along their nose and back. 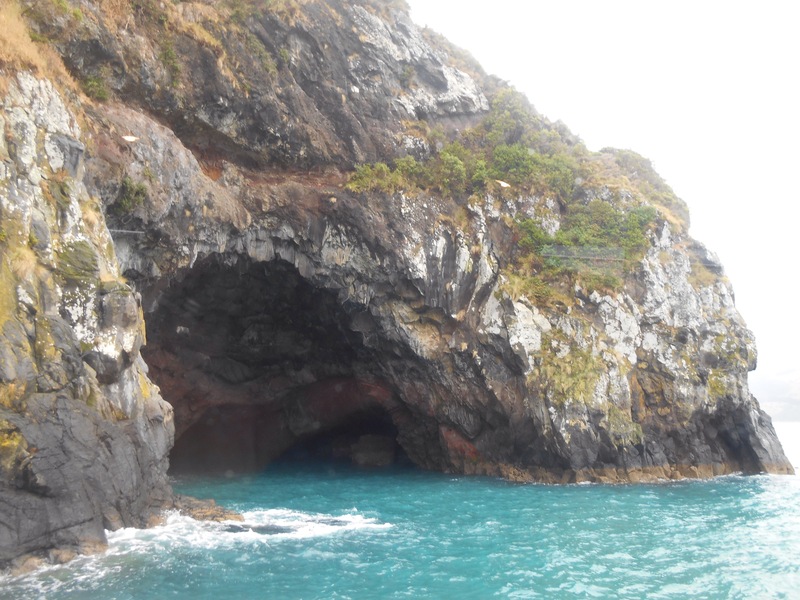 We spent a long time turning in the waves, watching them play, before the boat took off, again exploring the inlets of the rock and caves. 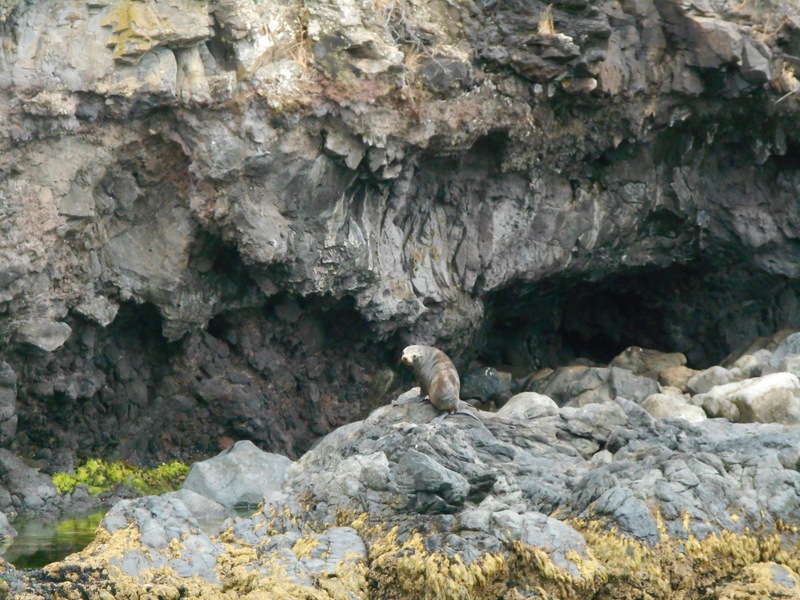 We passed a salmon farm and several colonies of sea lions, watching them walk clumsily on their dolphin tail feet. 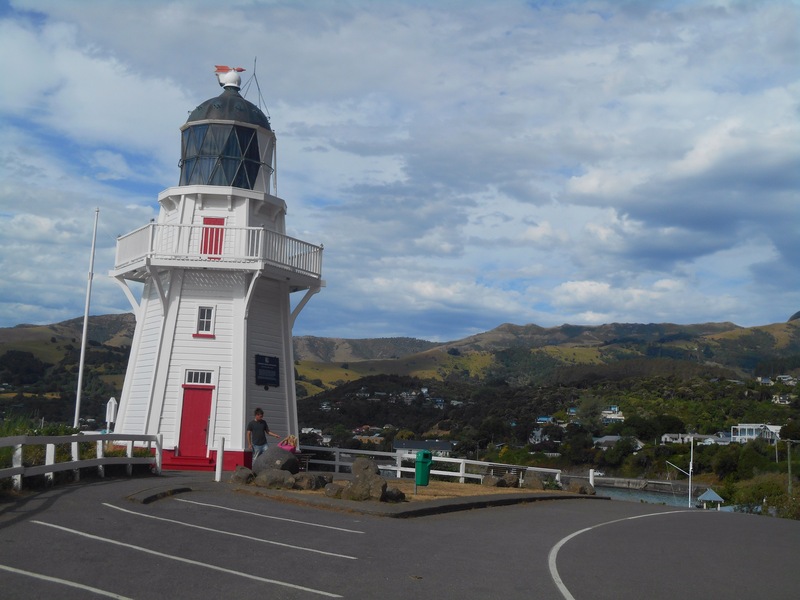 When the cruise came to an end I did a final lap of Akaroa’s small high street before getting the bus. 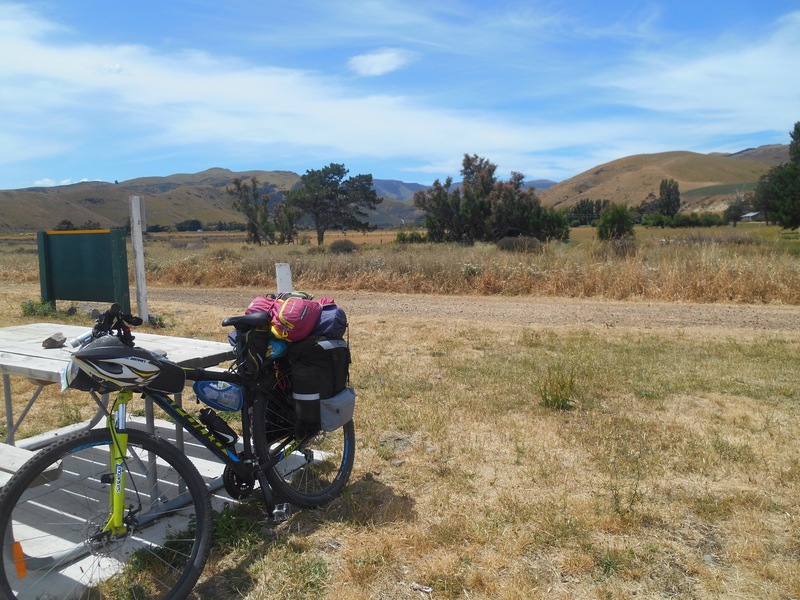 We stopped for some cheese samples at Barry’s bay cheese, before pushing on for Christchurch. I was hospitable catered for in Linwood by Mika’s family (a dive friend) who helpfully were going to give my bike a home for the festive period. Feeling refreshed after the luxury of a night in a bed, I began the 24 hour bus-ferry-bus to Auckland, home for Christmas! You have overcome some really interesting challenges. I admire you so much. The dolphins would be a highlight but, I also love your pictures and can imagine the rest of the scenery from your clear descriptions. I think this is one of my favourite blogs of yours.